Welcome to the Ken Doherty page. I've just got this site up and running, but hopefully it will soon have news, photos and information about Ken Doherty. Don't forget to sign my guestbook at the bottom of this page. See the News section for more details on the Embassy World Championship. 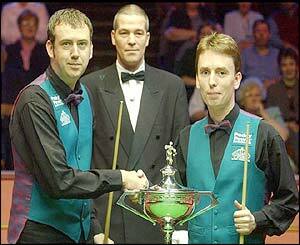 Ken Doherty and Mark Williams met at the final of this year's Embassy World Championship. 06/05/03: CREATED SITE! making homepage, adding counter, guestbook and photos.